Background: Preterm birth is the second leading cause of death next to pneumonia in children aged <5 years and the single-most important cause of death in the first month of life. Research examining determinants of preterm birth in Ethiopia is limited. Therefore, this study aimed to determine risk factors associated with preterm births at Jimma University Medical Center in southwest Ethiopia. Methods: This unmatched case–control study was conducted from March 15 to April 1, 2017 from medical records of mothers and newborns delivered at Jimma University Medical Center from January 1 to December 30, 2016. Data were extracted using a structured checklist for cases (preterm) and controls (term) by reviewing maternal and newborn medical records using a simple random-sampling technique. Risk factors for preterm delivery were determined using bivariate and multivariate logistic regression models. Statistically significant associations were declared at P<0.05. Results: The present study evaluated 218 maternal and newborn cases and 438 controls. Risk factors identified were history of previous preterm birth (AOR 6.4, 95% CI 2.9–13.9), preeclampsia (AOR 6.6, 95% CI 3.3–13.4), premature membrane rupture (AOR 11.7, 95% CI 6.2–21.9), antenatal care of fewer than four visits (AOR 4.8, 95% CI 1.2–19), birth interval <2 years (AOR 2.7, 95% CI 1.7–4.5), and multiple pregnancies (AOR 4.5, 95% CI 2.4–8.5). Conclusion: History of previous preterm births, preeclampsia, premature membrane rapture, antenatal care of fewer than four visits, birth interval <2 years, and multiple pregnancies were found to have a possible causal relationship with preterm births. Therefore, similar further studies should be conducted to generate more population-based evidence on determinants of preterm births. In developing countries, including sub-Saharan African nations, the attention given to PTBs is less. In Ethiopia especially, little is known about risk factors contributing to PTBs. Previous studies were focused mainly on the magnitude of PTB, rather than its determinants. Therefore, the major aim of this study was to determine factors associated with PTB at Jimma University Medical Center (JUMC), southwest Ethiopia. This study was conducted at JUMC from March to April 2017. The town of Jimma is located 357 km southwest of Addis Ababa, the capital of Ethiopia. As per JUMC statistics, the center is currently providing different services for approximately 18 million people in the catchment areas. Maternity services are one of the wards with highest patient flow. Last year, the total number of live births was 3,976, among which 3,504 were live term births and the other 472 live PTBs. This was a case–control study. Cases were live newborns delivered before 37 completed weeks of gestational age (preterm) at JUMC from January 1 to December 30, 2016. Controls were live newborns delivered after 37 completed weeks of gestational age (term) in the same study area during the same period. Cases and controls were randomly selected from medical records. where n1 is sample size, zα standard normal variant for level of significance, r number of controls per case, zβ standard normal variant for power or type II error, p1 probability of events in control group, and p2 probability of events in case group. Accordingly, the final sample size was 218 cases and 436 controls (total 654). We selected study candidates based on the following inclusion criteria: for cases, medical records of newborns of gestational age 28–37 weeks; for controls, medical records of newborns at 37–42 weeks of gestation with maternal records at JUMC from January 1 to December 30, 2016. Simple random sampling was used to select the study population: medical records of all live births delivered at JUMC during the study period, categorized into preterm (case) and term (control) based on gestational age from logbooks. Then, cases and controls were extracted from logbooks. Using SPSS software, desired sample sizes of 218 cases and 434 controls were selected by random sampling. Data were extracted by reviewing medical records of mothers and newborns using a structured checklist adopted from previous related studies.11,20,23,24 The quality of the data collected was guaranteed by pretesting being done on 33 mothers and their newborns before actual data collection, comprising eleven cases and 22 controls, and essential modifications then being made. The researchers trained the data collectors on how to collect data from the records to augment data accuracy and validity. There was close supervision of data collectors by the investigators. Data collected were coded and entered into EpiData 3.1 and exported to SPSS for version 21.0 for cleaning and analysis. Data were summarized using simple frequency tables, graphs, and charts. Bivariate analysis was done for candidate associated factors for multivariate analysis at P<0.25 and multivariate analysis employed to assess the relative effect of independent variables on dependent variables, with significance at P=0.05. Ethical clearance to conduct the study was obtained from the institutional review board of the Institute of Health, College of Public Health, Jimma University. Further permission was obtained from the medical director of JUMC and the department head of pediatrics and gynecology for the utilization of medical records. We guaranteed confidentiality by excluding names or any other personal identifiers from data-collection sheets and reports. The identifier for each eligible subject was replaced by a code, and no master code exists that allows the research data to be linked with the identifiers. A total of 656 case–control pairs were included in the study. From these, 218 pairs were medical charts of mothers and newborns of the case group and 438 pairs charts of the control group. Mean gestational ages of PTBs and term births were 34.6±2.1 weeks, and 40.3±1.4 weeks, respectively. Maternal residence revealed that more than half (120) of the case group resided rurally and the majority (262) of control mothers lived in an urban setting. Among cases, mean maternal age was 25.7±6.1 years, whereas the mean maternal age among controls was 26.44±5.6 years. 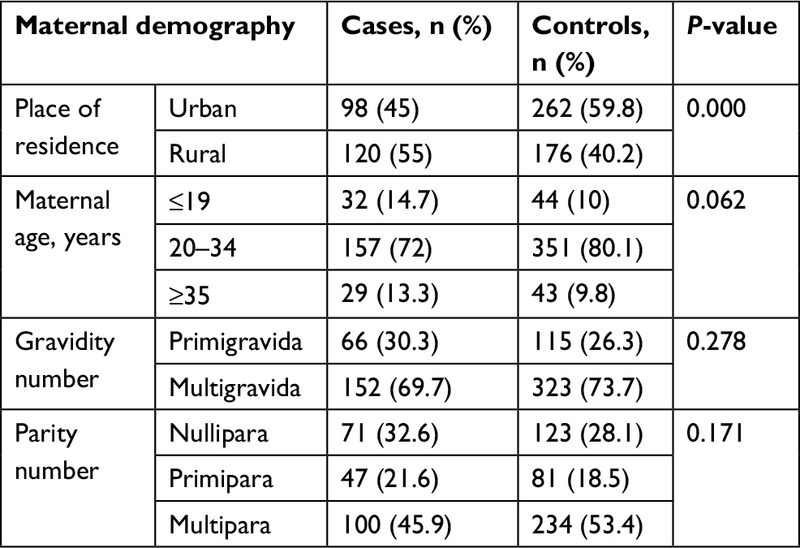 Among cases and controls, multigravida mothers comprised 152 (69.7%) and 323 (73.7%), respectively. In the case group, multipara was 45.9%, and in the control group this was 53.4%. Maternal demographic characteristics showed that there was a relationship between maternal residence and PTB (Table 1). Among cases, 31 (14.2%) mothers had a history of abortion, while only 42 (9.6%) had a history of abortion in the control group. Nearly half (105, 48.2%) of cases and a third (127, 29%) of controls had birth intervals <2 years. In the case group, those that had had fewer than four ANC visits numbered 201 (92%). In the control group, those that had had fewer than four ANC visits numbered 387 (88.4%). Hemoglobin <11 g/dL was seen in 49 (11.2%) cases, while 49 (11.2%) controls had hemoglobin <11 g/dL. Among cases, the majority (187, 85.8%) of mothers gave birth through spontaneous labor, while 421 (96.1%) gave birth through spontaneous labor in the control groups (Table 2). With regard to maternal history of illness among cases, the prevalence of hypertension, cardiac disease, and diabetes mellitus was 13 (6%), six (2.8%), and seven (3.2%), respectively, while the prevalence of these was eight (1.8%), four (0.9%) and ten (2.3%), respectively, among the controls. During the current pregnancy, illnesses observed among case-group mothers were anemia 32 (14.7%), HIV infection 8 (3.7%), hyperemesis gravidarum 22 (10.1%) and urinary tract infection 27 (12.4%), while 15 (3.4%), four (0.9%), eleven (2.5%), and 26 (5.9%) of control-group mothers had the same illnesses, respectively. Preexisting disorders and illnesses during the current pregnancy were not significantly associated with gestation age of the newborn. PROM, preeclampsia, and antepartum hemorrhage (APH) occurred in 70 (32.1%), 69 (31.7%), and 43 (19.7%) of the case group, respectively, while 23 (5.3), 22 (5%), and 13 (3%), respectively, were observed in their counterparts. 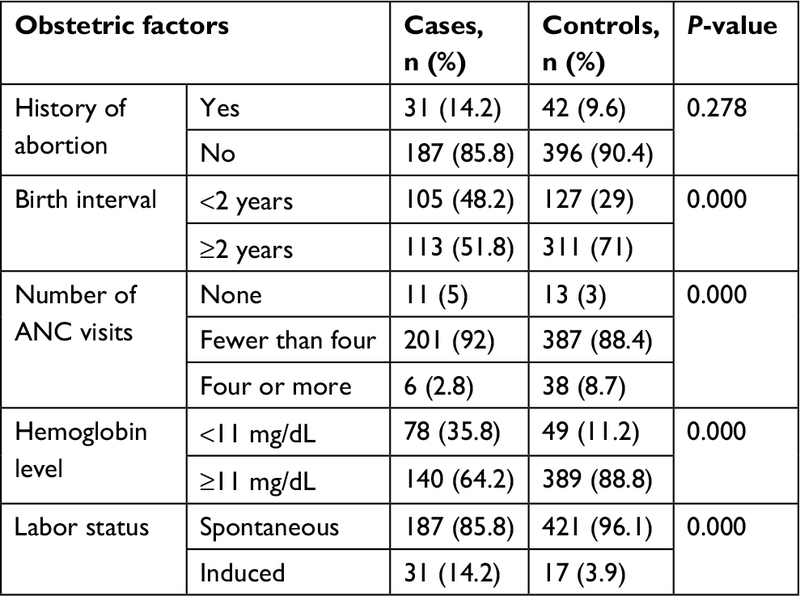 Current obstetric complications were significantly associated with gestational category of the newborn (Table 3). Abbreviation: APH, antepartum hemorrhage; PIH, pregnancy-induced hypertension; PROM, prolonged rupture of membrane. Mothers with a history of PTB had sixfold-higher odds of having PTBs (AOR 6.4, 95% CI 2.9–13.9) compared to mothers with no history of previous PTBs. Mothers with a history of stillbirths were four times (AOR 4.2, 95% CI 2–8.9) as likely to have PTB than their control counterparts. The odds of having PTB among mothers who had anemia were 2.7 times that of those who had not anemia (AOR 2.7, 95% CI 1–7.01). Mothers who had a history of APH during pregnancy had eight times the odds of having PTBs compared to those who had not had APH (AOR 8.1, 95% CI 3.5–18.5). Similarly, the odds of having PTB among mothers who had preeclampsia during the current pregnancy were 6.6 times that of mothers who did not have preeclampsia (AOR 6.6, 95% CI 3.3–13.4). 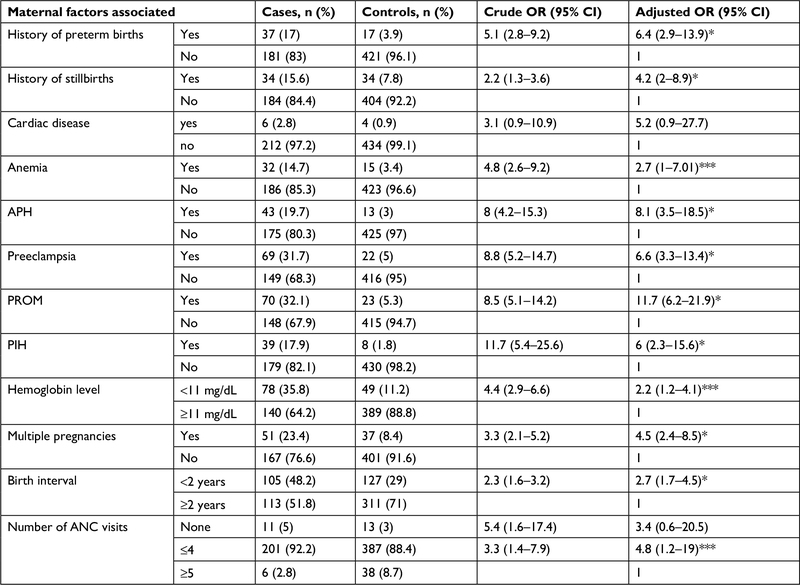 PROM was associated with an 11.7-fold increased risk of PTB (AOR 11.7, 95% CI 6.2, 21.9), while the odds of PTB among mothers who had PIH were six times that of mothers who did not have PIH (AOR 6, 95% CI 2.3–15.6). The odds of PTB among mothers who had had fewer than four ANC visits was 4.8 times that of those mothers who had had four or more (AOR 4.8, 95% CI 1.2–19). Those women who had hemoglobin levels <11 g/dL had 2.2 times increased risk of PTB compared to their counterparts (AOR 2.2, 95% CI 1.2–4.1). Similarly, birth interval <2 years carried three times the risk of PTB (AOR 3.4, 95% CI 0.6–20.5), and women who had had multiple pregnancies also had nearly three times the risk of PTB (AOR 2.7, 95% CI 1.7–4.5) compared to those mothers who had had a single pregnancy (Table 4). Notes: By backward removal analysis, reference category for logistic regression represented by 1. *P<0.0001; ***P<0.05. Abbreviations: ANC, antenatal care; APH, antepartum hemorrhage; PIH, pregnancy-induced hypertension; PROM, prolonged rupture of membrane. PTB remains a significant cause of morbidity and mortality among neonates and children. According to the 2016 Ethiopia Demographic and Health Survey, neonatal mortality was 29 per 1,000 live births, and among these PTBs were the major factor.10 The present study aimed to assess determinants of PTB, in order to contribute to tackling morbidity- and mortality-related PTBs. This study has attempted to look at the determinants of PTB by incorporating as many as risk factors as possible. We found that numerous maternal factors were significantly associated with a PTB. These included history of PTB, stillbirth, obstetric complications, anemia, hemoglobin level, birth interval, and number of ANC visits. Similar findings have been reported in Iran, Palestine, and Tanzania.20,26,27 In line with these findings the literature shows that history of previous PTB increases the risk of recurrent PTBs.13 This indicates that the risk of PTB is higher in women with a history of PTB and stillbirth, which may enhance the odds of a subsequent recurrence of PTB. The present study showed that current obstetric complications, such as APH, PROM, PIH, and preeclampsia were associated with the risk of PTB. 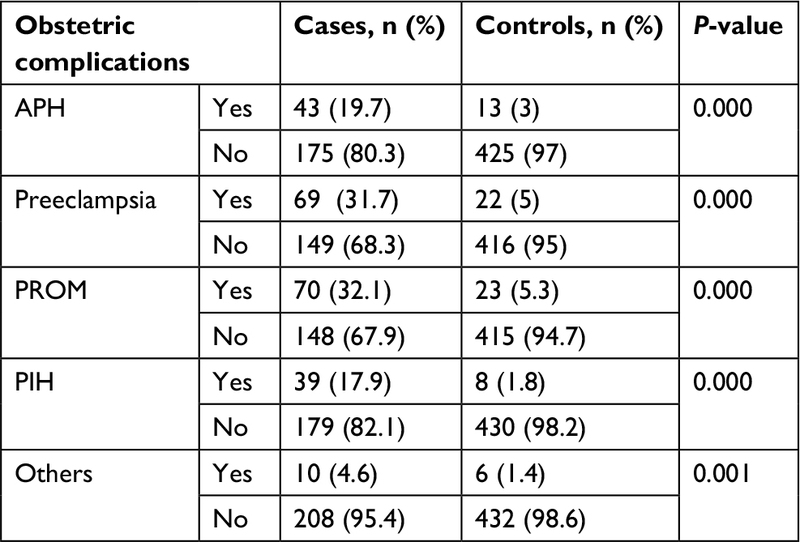 Similarly significant associations have been observed in Iran, China, and India.14,21,28 This indicates that it is a likely possibility that occurrences of PTB may be much influenced by current obstetric complications. Another finding also indicated that obstetric complications increased the risk of PTB by 40%–45%.29 This may be related to reduced placental blood flow, which would affect the exchange of nutrients and oxygen between the mother and fetus. This would result in decreased fetal growth and increase the risk of abnormal pregnancy outcomes, such as intrauterine growth restriction, low birth weight, and PTB. We also found that the number of ANC visits during pregnancy was another significant determinant of PTB. The proportion of PTBs was significantly higher among mothers who had had fewer than four ANC visits. This finding agrees with several studies15,18,26 that found that lack of adequate ANC during pregnancy increases the risk of PTB, and shows that lack of adequate ANC decreases the chance of identifying risks of PTB and providing appropriate interventions for its prevention. Having had multiple pregnancies was also found to be a significant determinant of PTB. This finding is supported by other similar studies conducted in Iraq, Palestine, and Tanzania.17,22,30 As indicated in the literature, multiple pregnancies increase the risk of PTB by 17%–23%, depending on gestational age.31 The possible reason may be early onset of uterine contractions due to overdistension and the association of multiple pregnancies with other factors, such as hydramnios, APH, PROM, and preeclampsia, all of which may increase risk of PTB. This study also showed that birth interval was significantly associated with PTB. This finding agrees with a study from the United Arab Emirates that revealed birth interval <15 months increased the risk of PTB 5.4-fold.32 This indicates that short birth interval is significant risk factor for PTBs. This study revealed that anemia and low hemoglobin levels (<11 mg/dL) were a significant risk factor for PTB, but the finding regarding hemoglobin levels was lower compared to a study reported in Pakistan (AOR 28).30 This might be due to a variation in cutoff points for hemoglobin levels and perhaps also sample-size variation. Strengths of this study include the fact that it used statistical analyses appropriate to the study design and that cases and controls were selected correctly for a case–control study, with the results matching the method described. Limitations include the use of medical records of mothers and PTBs admitted to JUMC, the results of which might lack generalizability to the entire population in the catchment areas. Other possible confounders not adjusted for during the current study may influence observed associations. The present study indicated that history of PTBs, preeclampsia, PROM, ANC of fewer than four visits, birth interval <2 years, and multiple pregnancies had a possible causal relationship with PTBs. Therefore, it is important that further community-based interventional studies be conducted on a larger scale to broaden the understanding obtained from this initial study. All authors made substantial contributions to conception and design, acquisition of data, or analysis and interpretation of data; took part in drafting the article or revising it critically for important intellectual content; gave final approval of the version to be published; and agree to be accountable for all aspects of the work. This study was funded by Jimma University postgraduate office. The authors are thankful to the Faculty of Public Health, Jimma University, for financial and technical support. They are also grateful to the JUMC staff and administrators for their support in the whole process of the study. Finally, they thank the research assistants who contributed to data collection. Behrman RE, Butler AS. Preterm Birth: Causes, Consequences and Prevention. Washington: National Academies Press; 2007. Howson CP, Kinney MV, McDougall L, Lawn JE. Born too soon: preterm birth matters. Reprod Health. 2013;10 Suppl 1:S1. United Nations Children’s Fund. The State of the World’s Children 2009: Maternal and Newborn Health. New York: UNICEF; 2009. World Health Organization. International Statistical Classification of Diseases and Related Health Problems. 9th ed. Geneva: WHO; 2012. Vogel JP, Chawanpaiboon S, Watananirun K, et al. Global, regional and national levels and trends of preterm birth rates for 1990 to 2014: protocol for development of World Health Organization estimates. Reprod Health. 2016;13(1):76. World Health Organization. World Health Statistics: A Wealth of Information on Global Public Health. Geneva: WHO; 2014. Blencowe H, Cousens S, Chou D, et al. Born too soon: the global epidemiology of 15 million preterm births. Reprod Health. 2013;10 Suppl 1:S2. Menon R. Preterm birth: a global burden on maternal and child health. Pathog Glob Health. 2012;106(3):139–140. Lawn JE, Gravett MG, Nunes TM, Rubens CE, Stanton C. Global report on preterm birth and stillbirth (1 of 7): definitions, description of the burden and opportunities to improve data. BMC Pregnancy Childbirth. 2010;10 Suppl 1:S1. DHS Program. Ethiopia Demographic and Health Survey – 2016. Rockville (MD): ICF; 2016. Berhe H, Berhe H, Zeleke D. Factors associated with patterns of birth outcome at public hospitals in Mekelle Town, Tigray Region, Ethiopia, 2013: a case-control study. J Bio Innov. 2015;4(2):67–81. World Health Organization. African Regional Health Report 2014. Geneva: WHO; 2014. Offiah I, Donoghue KO, Kenny L. Clinical risk factors for preterm birth. In: Morrison J, editor. Preterm Birth: Mother and Child. Rijeka, Croatia: InTech; 2012:73–94. Zhang YP, Liu XH, Gao SH, et al. Risk factors for preterm birth in five maternal and child health hospitals in Beijing. PLoS One. 2012;7(12):e52780–e52787. Iyoke CA, Lawani LO, Ezugwu EC, Ilo KK, Ilechukwu GC, Asinobi IN. Maternal risk factors for singleton preterm births and survival at the University of Nigeria Teaching Hospital, Enugu, Nigeria. Niger J Clin Pract. 2015;18(6):744–750. van den Broek NR, Jean-Baptiste R, Neilson JP. Factors associated with preterm, early preterm and late preterm birth in Malawi. Plos One. 2014;9(3):e90128. Mahapula FA, Kumpuni K, Mlay JP, Mrema TF. Risk factors associated with pre-term birth in Dar es Salaam, Tanzania: a case-control study. Tanzan J Health Res. 2016;18(1):1–8. Zhang X, Zhou M, Chen L, Hao B, Zhao G. Risk factors for preterm birth: a case-control study in rural area of western China. Int J Clin Med. 2015;8(3):4527–4532. Ip M, Peyman E, Lohsoonthorn V, Williams MA. A case-control study of preterm delivery risk factors according to clinical subtypes and severity. J Obstet Gynaecol Res. 2010;36(1):34–44. Alijahan R, Hazrati S, Mirzarahimi M, Pourfarzi F, Hadi PA. Prevalence and risk factors associated with preterm birth in Ardabil, Iran. Iran J Reprod Med. 2014;12(1):47–56. Bakhteyar K, Lorzadeh N, Pournia Y. Factors associated with preterm delivery in women admitted to hospitals in Khorramabad: a case control study. Int J Health Allied Sci. 2012;1(3):147–152. Al-Dabbagh SA, Al-Taee WY. Risk factors for pre-term birth in Iraq: a case-control study. BMC Pregnancy Childbirth. 2006;6:13. Bekele T, Amanon A, Gebreslasie KZ. Preterm birth and associated factors among mothers who gave birth in Debremarkos town health institutions, 2013 institutional based cross sectional study. Gynecol Obstet (Sunnyvale). 2015;5(5):1000292. Gebreslasie K. Preterm birth and associated factors among mothers who gave birth in Gondar town health institutions. Adv Nurs. 2016;2016:4703138. Desalegn L. Determinants of Low Birth Weight In Debre Berehan Referal [sic] Hospital, North Shoa Zone, Amhara Regional State, Ethiopia (A Case–Control Study) [master’s thesis]. Addis Ababa: Addis Ababa University; 2016. Temu TB, Masenga G, Obure J, Mosha D, Mahande MJ. Maternal and obstetric risk factors associated with preterm delivery at a referral hospital in northern-eastern Tanzania. Asian Pac J Reprod. 2016;5(5):365–370. Sarhan AL, Anini HE. Risk factors of preterm birth among Palestinian women: case control study. Austin J Nurs Health Care. 2015;2(1):1011. Rao CR, de Ruiter LE, Bhat P, Kamath V, Kamath A, Bhat V. A case-control study on risk factors for preterm deliveries in a secondary care hospital, southern India. ISRN Obstet Gynecol. 2014;2014:935982. Plunkett J, Borecki I, Morgan T, Stamilio D, Muglia LJ. Population-based estimate of sibling risk for preterm birth, preterm premature rupture of membranes, placental abruption and pre-eclampsia. BMC Genet. 2008;9:44. Baig SA, Khan N, Baqai T, Fatima A, Karim SA, Aziz S. Preterm birth and its associated risk factors: a study at tertiary care hospitals of Karachi, Pakistan. J Pak Med Assoc. 2013;63(3):414–418. Allen VM, Wilson RD, Cheung A. Pregnancy outcomes after assisted reproductive technology. J Obstet Gynaecol Can. 2006;28(3):220–233. al-Jasmi F, al-Mansoor F, Alsheiba A, Carter AO, Carter TP, Hossain MM. Effect of interpregnancy interval on risk of spontaneous preterm birth in Emirati women, United Arab Emirates. Bull World Health Organ. 2002;80(11):871–875.